MONTICELLO – The University of Arkansas at Monticello volleyball team recorded a 3-0 sweep over Arkansas-Pine Bluff on Tuesday night in the first home match of the 2013 season. Final game scores were 26-24, 25-20 and 25-20. The Blossoms (3-2) needed extra points to get past the Lady Lions (2-10) in the first set despite holding a 23-21 advantage following a four-point swing, including three straight kills for senior Tori Bozzo and a service ace from junior Jessica Cuba. The Lady Lions forced a 24-all tie using an ace and a UAM error. Junior Christina Rini set up UAM with a set point with a kill, following by an ace from senior Amy Bazemore. In the second set, UAM got out to a 16-8 lead before allowing UAPB to rally to a three-point deficit at 16-13 following a kill from Ashlie Jones. Junior Tasha Evans put UAM two sets to none with three kills down the stretch. UAPB led for the first 19 points scored of the third set before Bozzo took over with four aces and two kills during a 8-0 run to put the Blossoms up 21-13. Bozzo finished the match with six service aces. Three straight UAM errors at match point allowed UAPB to trim the lead to just four points before UAPB’s Audrey Sherles committed a service error to seal the victory for UAM. Bozzo led UAM 10 kills on 26 attempts with five errors for a .192 hitting percentage. Cuba and senior Holly Schweigert each added seven kills, while junior Christina Rini lead the team with a .462 hitting percentage with six kills and no errors on 13 attempts. Senior Tusalava Kuaea paced the UAM defense with 14 digs, with Rini and junior Gabriella Jandotti aiding to the effort with two blocks solos each. Bazemore totaled a match-high 30 assists in the win, her first 30-assist match of the season. Ayanna Parker led UAPB with 11 kills. The Blossoms remain at home for this weekend’s Hampton Inn Invitational. UAM and West Alabama open the event at 7 p.m. this Thursday, Sept. 12. That is the first of 13 matches to be played Thursday-Saturday. 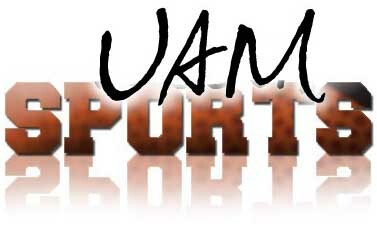 A full tournament schedule is available at the tournament home page: http://uamsports.com/sports/2013/9/9/VB_0909133657.aspx.